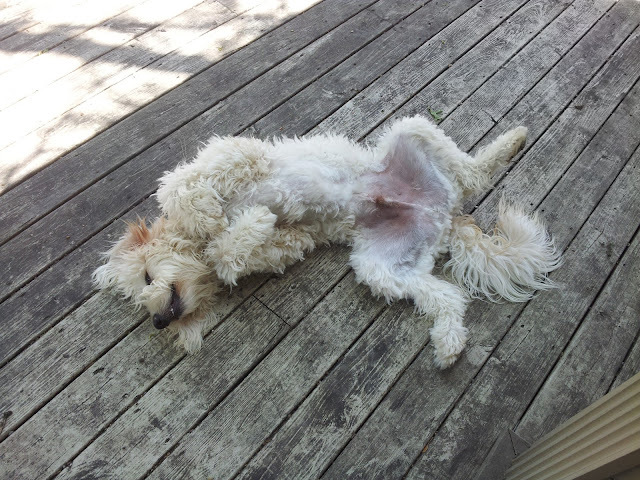 Goldilocks & Her Doodle: Summer Lovin'! When Jeff and I were looking for a house, I was very adamant that I wanted a pool. I grew up on a lake, swimming whenever it was hot, and now living in a state where temperatures peak in the low 100s, I was emphatic that a pool was a necessity. There were an awful lot of naysayers who said that a swimming pool would be full of maintenance, too costly, and a detriment when we finally want to sell and move on. I tuned out all the Negative Nellies and kept on looking. Despite the lack of a pool, summer is in the air, especially in our backyard. We might not have a grand indoor swimming pool with deluxe water slide and 10-jet jacuzzi, but we do have one of these. I know what you are thinking - this is sad and strangely pathetic. 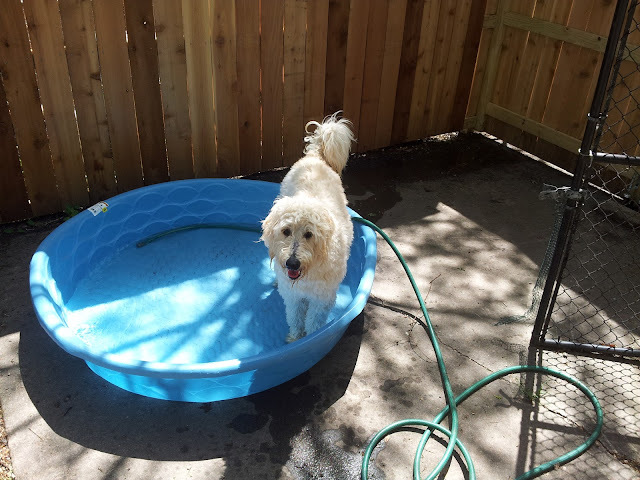 Well, this big blue pool fits in our yard, we can store it away when we are done with it, AND it is still large enough to fit both Milt Dog and me. 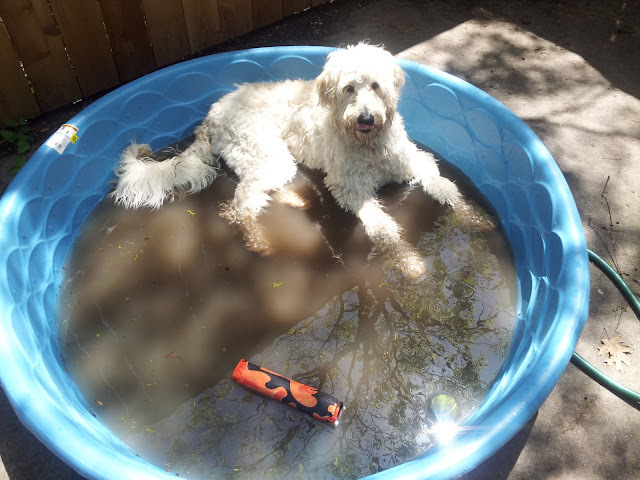 Our goldendoodle feels pretty darn lucky to have his own private watering hole out back. Once Milton gets even one paw damp, he likes to go roll about and get all that wet off. 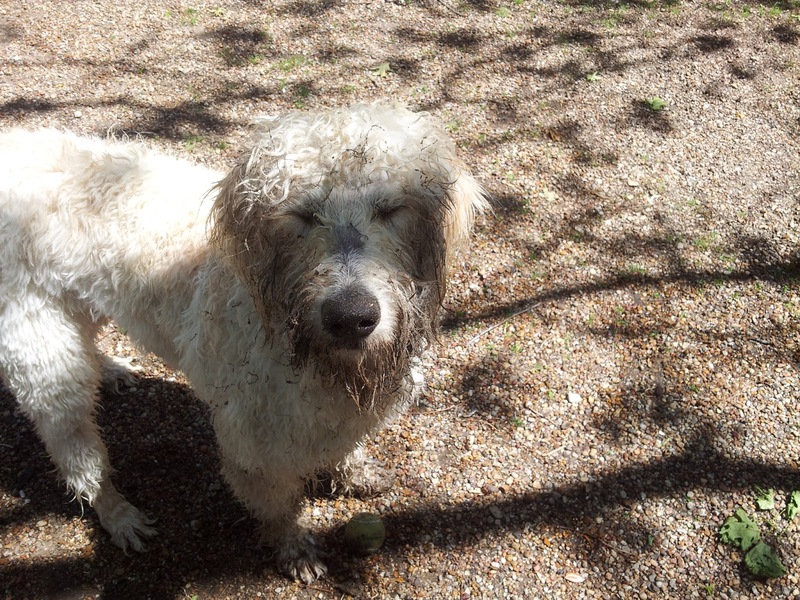 Then, of course, he likes to go and get all that dirt off. Our pool becomes a muddy mess that eventually requires two people to pick up and dump out, if we can. If not, we start bailing with buckets until we lighten the load. Once Milt has been properly hosed down following his mud bath, he can just kick back on our deck and dry that big 'ole belly. It is not exactly Owasco Lake, where I grew up, but water in the backyard is still a little piece of home, and Milt's love of water certainly takes after his Momma Dog who got it from her dad when she was a little girl. Yesterday, April 17th, was the two-year anniversary of my dad's death, and Jeff and I chose to remember him by attending mass and eating a memorial dinner of two of his favorites - cheesesteak subs and caramel sundaes from McDonald's. My dad instilled in me many, many things, but a love of water tops the list. I am glad to know that I am passing this appreciation along to the Milt Dog. How funny is that boy??? Stanlee stepped in poo last week and instead of bathing him like a good mommy, I just filled the kiddie pool we have and let him bathe himself. Of course he won't lay down in the water. How did you get Milt to do this or was it natural?